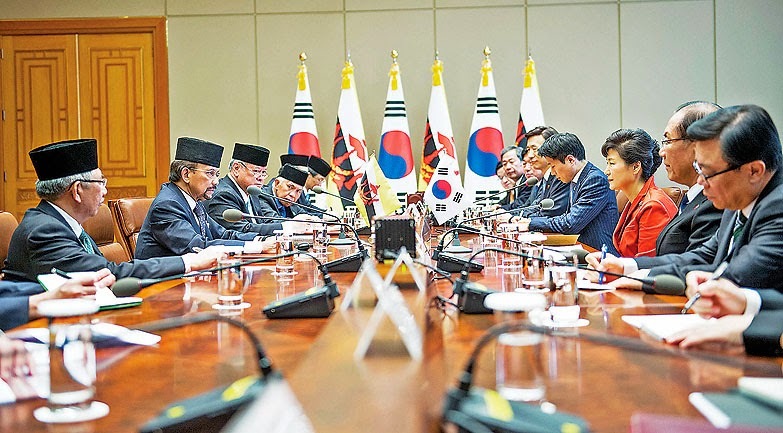 HIS Majesty the Sultan and Yang Di-Pertuan of Brunei Darussalam lauded the strong energy partnership between Brunei Darussalam and Korea spanning over the past 20 years, as energy cooperation remains the core of economic engagement between both countries. His Majesty expressed his pleasure that the LNG contract between the countries has been extended until 2018. The monarch was delivering a titah at a State Banquet hosted by Park Geun-hye, President of the Republic of Korea, in conjunction with the State Visit of His Majesty from December 8-10. The State Banquet was held at the Yeong Bin Gwan Hall, Cheong Wa Dae, Seoul. His Majesty was greeted on arrival at the Cheong Wa Dae by the President of the Republic of Korea. Before the State Banquet commenced, President Park was introduced to Brunei Darussalam’s delegation followed by His Majesty to the special guests of President Park. The State Banquet began with the national anthem of both countries. President Park delivered an address welcoming His Majesty on the occasion of His Majesty’s State Visit to the Republic of Korea. 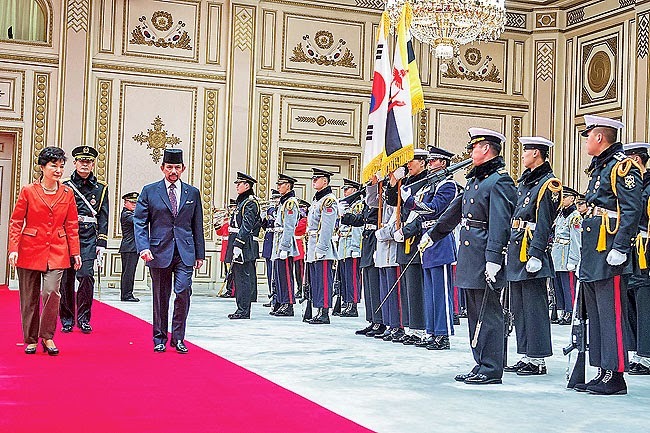 In the titah, His Majesty said Brunei values Korea’s assistance in the construction of vessels for Brunei’s LNG consignments and is ready to continue working closely with Korea to further enhance the long-standing cooperation in this area. His Majesty acknowledged Brunei and Korea have enjoyed steady progress in bilateral cooperation that extends to many areas including energy, education, agriculture and people-to-people exchanges. His Majesty was most heartened to see Brunei and Korea building on these existing achievements by signing three agreements during this visit. His Majesty expressed his confidence that the bilateral ties will continue to prosper for the mutual benefit of the peoples of Brunei and Korea. His Majesty also said Brunei appreciates Korea’s continued efforts to promote youth exchanges, particularly through the Brunei-Korea Youth Exchange Programme. 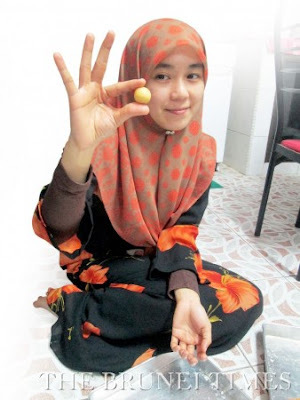 The people of Brunei, especially the younger generation, have developed a keen interest in the Korean language, food and culture, which has created strong bonds of friendship and understanding between the peoples. 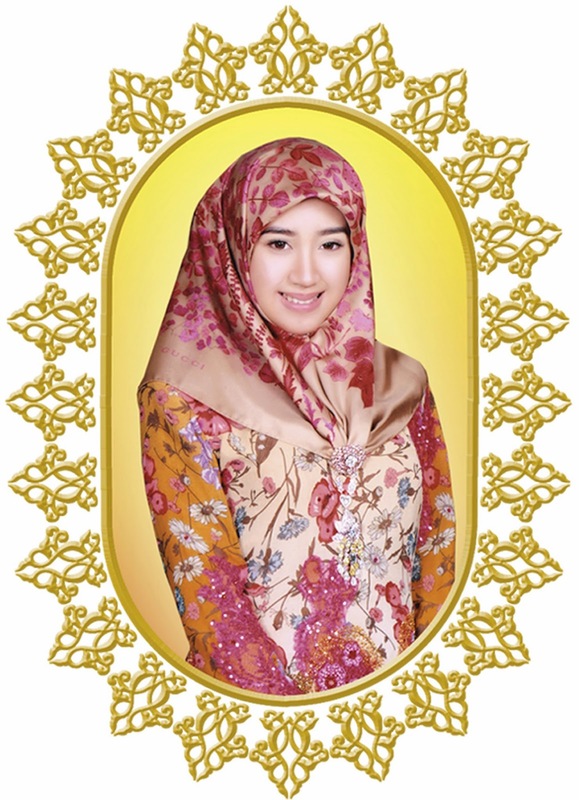 At the same time, Brunei and Korea are also making great strides through the close partnership in the field of e-government, where Korea’s assistance and expertise in developing Brunei Darussalam’s ICT has been invaluable. 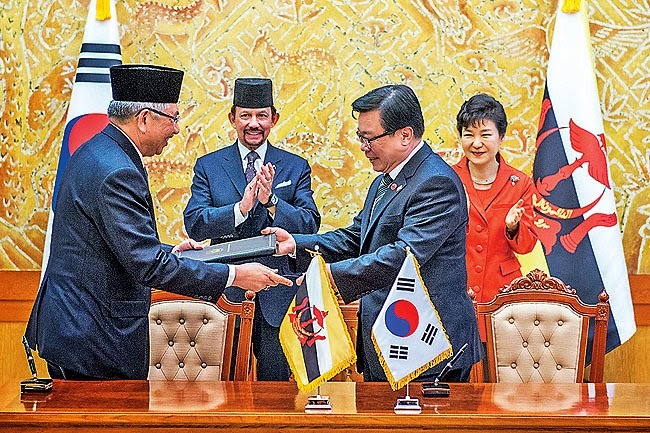 Brunei also appreciates the contributions of Korean companies in Brunei’s development efforts and continues to warmly welcome them to the Sultanate, His Majesty further added. His Majesty noted Korea has achieved rapid economic growth over the past few decades. Today, Korea is widely regarded as a leading economy with world-class industries, well-known for their technological advancements. Korea’s achievements are an inspiration to many around the world. 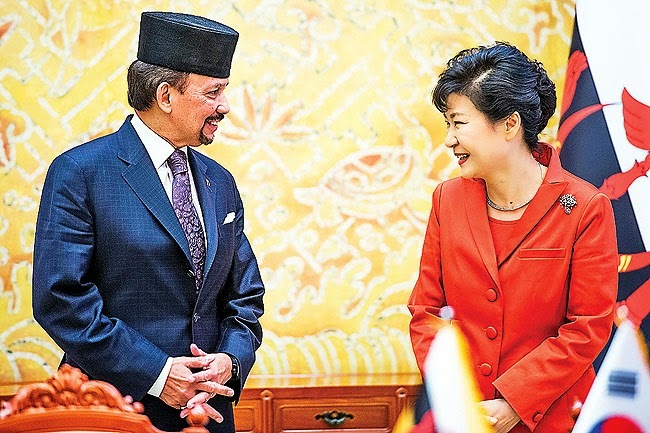 His Majesty stated that Brunei hoped to learn much from Korea’s experience, especially as Brunei move towards 2035 in pursuit of Brunei Darussalam’s own development vision. His Majesty noted that this year is a special occasion for relations between Asean and Korea, which now enters its 25th year of excellent cooperation and reaffirmed Brunei’s commitment to continue working closely to further enhance the Asean-Korea partnership. His Majesty looked forward to celebrating 25 years of Asean-Republic of Korea dialogue relations and wished President Park and Korea much success in hosting the Asean-Republic of Korea Commemorative Summit in Busan. In closing, His Majesty again thanked the president, the government and people of Korea for the friendship and goodwill that has been extended to Brunei and its people. His Majesty also looked forward to strengthening the warm and close friendship so happily enjoyed by the peoples of Brunei and Korea. Accompanying His Majesty at the State Banquet were Pehin Orang Kaya Laila Setia Dato Seri Setia Awang Haji Abdul Rahman bin Haji Ibrahim, Minister of Finance II at the Prime Minister’s Office; Pehin Orang Kaya Pekerma Dewa Dato Seri Setia Lim Jock Seng, Minister of Foreign Affairs and Trade II; and Pehin Datu Singamanteri Colonel (Rtd) Dato Seri Setia (Dr) Awang Haji Mohammad Yasmin bin Haji Umar, Minister of Energy at the Prime Minister’s Office.